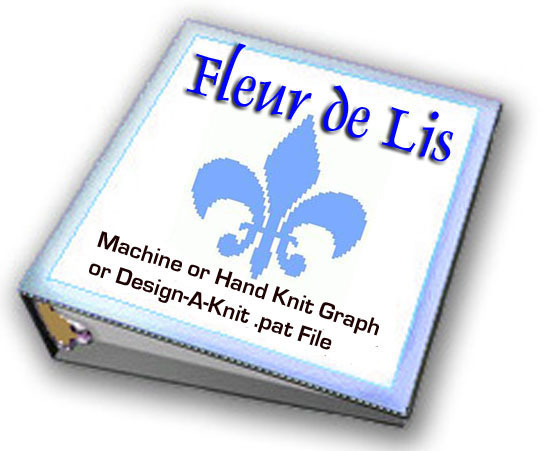 Fleur de Lis Available in Hand Knit Graph or Design-A-Knit .pat file. This graphic is 62 stitches x 94 rows. On a scale of 8 stitches x 11 rows = 1 inch, it measures 7.75" x 8.5" including minimal white space surrounding the Fleur de Lis. NOTE: The .pat file requires DAK (Design-A-Knit) Software. The Graph is just that, no written instructions. We also have the Cross Stitch pattern for this design created in Hobbyware's Cross Stitch Pattern Maker program in their .pat file. Please check our Cross Stitch category for details.